Important Update: The huge Marvel jackpots have now moved over to PlayTech's DC Comics slots and table games. This roulette variant is now found under 'Age of the Gods Roulette' (though is essentially the same!) ... there are some excellent titles in this range (find out more in this detailed PlayTech Slot Jackpots page at SNG Planet). As for the Marvel titles, they are gone. The deal with PlayTech ended, and the slots are no longer online. There are plenty more excellent games in the PlayTech range, my go-to for them is BGO casino. You'll get 10 no-deposit free spins (and can keep what you win without play-through) to check out the games. See www.bgo.com for details! Roulette is a game that has made the transition from land based casinos to virtual casinos almost seamlessly, the game being one of the most popular in any casino. In some ways virtual casinos have an advantage when it comes to Roulette in that they have more scope with their games and can offer varieties of games that are just not possible in land based casinos. One such examples of this is Marvel Roulette, the game based around the comic characters such as Spider-Man, Wolverine, Iron-Man and Captain America. When you first enter Marvel Roulette you’ll be met by a layout that looks very much like traditional Roulette, the main obvious difference being the surround of the table, featuring Super-Hero figures. However, there is another key difference – that being the bonus well and the ability to bet on this bonus well. 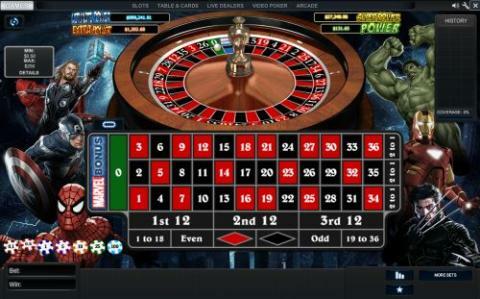 The wheel has all the standard red and black numbers and the green zero, although here you’ll also find a blue slot on the wheel called ‘Marvel Bonus’ as well as the blue ‘Marvel Bonus’ section added to the betting area. The game works exactly the same way as normal roulette, and you can actually ignore the bonus features and play a standard game. However the real excitement of this game comes with the bonus features. To enable this feature, the ball will have to land in the bonus well after you have placed a bet on this outcome. Having achieved this you’ll be taken to a 3-reel slot machine and have three spins at this slot. The slot features Marvel characters on the reel and if you can line up three in a row you’ll win a prize. These prizes are multipliers based upon your original stake at the table – for example if you hit three Iron-Man symbols in a row you’ll win 25x your stake, or three Spider-Man symbols will win you 100x your stake. You are guaranteed a win at this stage, it’s only a question of how big. However this is not the only way you can win big at this game – the Marvel Mystery Jackpot can also be won. As you can see, there are some life changing sums of money available at this version of Roulette, and it is understandable why this is so popular with players at online casinos. When it comes to innovations in gambling, Betfair have been at the very forefront, their exchange model revolutionizing the gambling industry soon after their formation in 1999. 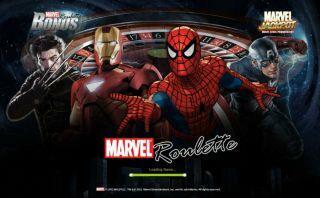 The Betfair Casino continues this tradition with a great mix of standard games and innovative new games, Marvel Roulette being a prime example. When signing up at this exciting site, you’ll be able to take advantage of one of three bonuses. The first of these is for all games at the site and is a 200% Match bonus of up to £300. Secondly, for slots players exclusively, you can earn an extra £1,000 with a 200% Match Bonus. Finally, there is a 100% Match bonus of up to £200 for players in the live casino – here you’ll play at a real table with a live dealer, all streamed for a casino studio where you’ll be betting on the real action. Having signed up to the casino, you’ll find many great varieties of Slots, Blackjack, Scratch Cards and many more. For the Roulette fan, as well as great versions of European, American and French Roulette, you’ll also find some other novelty versions. These include Mini Roulette, where you’ll play at a table with just twelve numbers – this being a surprisingly addictive version of the game. You’ll also be able to play multi-wheel Roulette, where your bet/s will be placed and await the outcome of six separate wheels. The live casino also offers Roulette of course, with the glamorous dealers being a popular feature of these games.